Giddy on up to Texas' best dude and guest ranches! Learn to horseback ride with real life cowboys! Dine a hearty cowboy breakfast or a Texas-sized steak! And camp out underneath the stars. Experience the Old West when you visit Texas' Hill Country! Saddle up for an authentic ranch experience at this secluded stay. Located just 10 miles from Bandera, "The Cowboy Capital of the World," West 1077 Guest Ranch is a genuine trip back to a simpler time. The rolling landscape of Texas Hill Country serves as your personal playground, beckoning you to explore the ruggedly beautiful terrain.With direct access to the 5,400-acre Hill Country State Natural Area, you'll have plenty of space for hiking, biking, and horseback riding. Bring your own horse and explore nearly 50 miles of maintained trails for all ages. Juniper Hills Stables is located directly on the property and offers personalized guided trail rides in small groups just for guests. When you're not traversing the land with your trusty steed, your horse will receive excellent accommodations like inside or outside stalls, corrals, and a riding arena. The horses aren't the only ones treated to outstanding accommodations. Enjoy the Old World charm of the Lodge, a cabin, or a cottage. Kick up your feet around the open fireplace, soak in the scenery on a porch rocking chair, or enjoy a family meal in the picnic area. Make a splash in the sparkling swimming pool and, after working up an appetite, savor a buffet-style breakfast and lunch. This secluded stay offers a true Old West experience! The Ranch itself showcases 230 scenic acres for hikers, joggers, bikers, and general explorers. If you'd like to wander off-site, ascend canyons that reach up to 2,000 feet in elevation. Make a splash in the Hill Country State Natural Area's secluded creek pools, where travelers can swim and fish. Breathe in the fresh Texas air and let a sense of calm wash over you. The Twin Elm Guest Ranch, situated in the beautiful Hill Country, is located in the Cowboy Capital of the World – Bandera. Experience a family-friendly adventure in Texas. This all-inclusive dude ranch features horseback riding, home-cooked meals and plenty of activities to keep you busy. Rustic and comfortable guest rooms feature a game room and living area. And some units even have bunk beds for younger children. The ranch also boasts a full-service RV Resort for those traveling with campers. Horseback riding is the main activity. Trek Twin Elm Guest Ranch’s 250 acres of diverse terrain, hills, woods and flatlands through the Medina. The Medina River runs right through the ranch, and camping or tubing on the river are popular activities. Canoe and kayak rentals are available nearby. The ranch also offers a swimming pool, horseshoes, a ropes course, basketball and so much more! And Bandera is known for its fun-loving cowboys and cowgirls, night clubs and dance halls. Rodeos are held every Friday beginning in April onto Labor Day that are free for ranch guests. Chuck Wagon races are held every May. The family-friendly Twin Elm Guest Ranch offers you a slice of the Old West and an all-inclusive escape from the city. Day trips to Medina River offer watersports including tubing, Jet Skis and more! Chuck Wagon racing is a one-of-a-kind racing and rodeo event hosted by Twin Elm Ranch. Located on the Brazos River, WB Ranch sits on 1,800 miles of Texas’ Hill Country. With its beautiful oak trees, bluffs, draws and creek, the ranch has operated as a corporate retreat and hunting preserve for over 10 years. WB Ranch’s lodge features all the amenities of a luxury resort. The beautiful and spacious lodge features a large fireplace, hand-stacked limestone walls, billiards and a bar as well as trophies from around the world decorating the walls. Lodge rooms feature hickory furnishings, private baths and Internet. WB Ranch offers team building activities for corporate groups including airboat rides, donkey races, a longhorn roundup, ropes course and so much more! Plus the Brazos River, named by early Spanish explorers as the ‘River of the Arms of God’, offers canoeing, swimming and wildlife tours. The ranch’s hunting preserve offers opportunities for guests to hunt for deer, doves, ducks, pheasants and turkeys. Guided hunts are the norm and Texas hunting licenses can be purchased at the ranch. A rifle and pistol range as well as clay shooting is also on site. Whether you are traveling for a corporate retreat or hunting excursion, WB Ranch is a perfect destination in Texas’ Hill Country. Whitney’s elevation is 594 ft (181 m). Saddle up at an authentic Texas dude ranch – Rancho Cortez. You’ll enjoy traditional dude ranch fun or an invigorating fitness ranch program or both! Rancho Cortez is an upscale ranch vacation. Unique and cozy lodging offers large porches, refreshing indoor and outdoor swimming pools, kid’s play area and hot tubs. Rough it and still be comfortable! Rancho Cortez doesn’t just provide you with things to do, the ranch provides you with an authentic cowboy experience. Horseback ride through Hill Country, exploring your unspoiled natural surroundings. Round up cattle on the cattle drive. Tube along the Medina River. Barrel race and pole bend at the ranch’s arena. Experience pioneer life in Hill Country with an overnight campout sleeping under the stars. Then kick back and relax on an old-fashioned hay ride. Or, visit the Rancho Cortez Fitness Ranch where you’ll get cowboy fit. Ranch-style boot camp programs challenge guests to lose weight, boost fitness levels and achieve overall health. Combining the latest exercise equipment with horseback riding through the countryside, Rancho Cortez isn’t your typical gym experience. Visit Rancho Cortez, an idyllic retreat for families and friends offering traditional dude ranch fun and an invigorating fitness ranch! Blending a unique mix of Indian, Polish, Mexican and Western cultures not found anywhere else in Texas, Bandera offers historical tours documenting legendary battles, settlements and more! 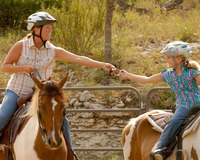 The Sugar and Spice Ranch Camp bonds mothers and daughters through horses. The ranch exclusively caters to mothers and daughters looking for the greatest bonding experience. Spend an all-inclusive week with the girls at a Western riding camp. In the ‘Cowboy Capital of the World’, mothers and daughters camp in a real bunkhouse and ride their very own horse for a week! This is an idyllic experience for any type of rider. You’ll learn how to care for your horse by grooming, feeding, bathing and riding. Trail rides along the Old Spanish Trail give you a peek into this historic area. The trail was once used for cattle drives from Mexico to Wyoming. The ranch’s lodge is the center of action, especially on the last day of your trip. A swim day at the outdoor swimming pool offers fun for mothers and daughters. Add in the ranch’s gourmet meals, nighttime bonfires and Tuesday-evening massages and your experience gets a little sweeter. Weekend, holiday and women-only packages are available! Bond as mother and daughter through horses and shed a few tears when its time to say goodbye to your horses. Bandera’s elevation is 1,243 ft (379 m). Bandera calls itself the ‘Cowboy Capital of the World’. There’s a cowboy in all of us! High in Texas’ Hill Country, you can become part of the Western tradition at the Mayan Dude Ranch, producer of seven world champion rodeo cowboys! Stay in rustic yet chic one-to three-bedroom western rock cottages, or luxurious lodge rooms with glorious views of Bandera and Hill Country. Start your day with a cool glass of orange juice and cowboy coffee brought to your room. The Cowboy Breakfast is the largest and best served on the trail. Then head off on a morning trail ride. The ranch’s cowboys will guide you through the hills or down to the Medina River. Trail rides are offered twice daily – once in the morning and once in the afternoon. Swim in the Texas-sized swimming pool – lunch is served here as well. Tube or fish along the Medina River. Tennis, basketball and volleyball courts are all found on-site. And at night, enjoy tons of brisket, ribs and tenderloin at the Riverside Gazebo’s BBQ as cowboy bands serenade you during your meal. Bandera is cowboy-land and there’s no better place to hang with cowboys than at the Mayan Dude Ranch. Bandera is the Spanish word for flag. Trade in your suit and tie for blue jeans and a bandana at Silver Spur Ranch! Here, you'll become one with the west, enjoying a variety of cowboy experiences and true western hospitality like you've never experience before. Located on over 300 beautiful acres in the Texas Hill Country, Silver Spur Ranch truly offers endless activities and entertainment. Start everyday with a hearty breakfast in their 100-seat dining room, then head out and hit the trails! Horseback riding is a favorite here, and whether you're a novice or expert, their staff will assist you in taking one of their beautiful horses out for a slow, relaxed ride. Hay wagon rides are popular with the kids, while adults enjoy grabbing a map from the lodge to explore the wilderness on a hike. Return to Silver Spur at the end of the day and relax by the fireplace in the lodge, or lounge at their spacious swimming pool. Then gather around the campfire and pop open those bags of marshmallows because it's story-time! And once the sky turns black and you can see the silvery stars, you can head to your charming accommodations. Choose from their lodge guestrooms or a cozy cabin, all named after notorious western legends such as Wild Bill Hickok and Jesse James! Sitting in the beautiful woods of Eastern Texas, the Primitive Acres Guest Ranch has been known for raising Red Brangus Cattle and Coastal Hay. 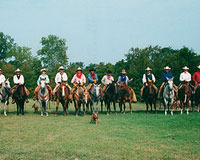 The ranch has grown to include a hunting camp and has become a family favorite Texas dude ranch. Open year-round, the ranch includes 10 camp sites, eight fully furnished cabins and cottages and four RV hookups for any type of Texas vacation. Hot tubs, outdoor swimming pool, concession stand and dining hall round out the ranch’s amenities. There are plenty of trails, creeks, gullies, hills and more to discover across Primitive Acres Guest Ranch. And you can bring your own ATVs, Jeeps, 4-wheelers, dirt bikes, dune buggies and other 4x4’s to explore! Horse, wagon and buggy rentals are available as well! Or, you can bring your own horse to be ridden with a guide only. And if you like to hunt, the hunting camp features sleeping quarters, a full kitchen, walk-in cooler and dining room for your hunting vacation. Dine on hickory steaks, pork chops and hearty fare at the dining hall, or host an outdoor BBQ of your own! Visit the Primitive Acres Guest Ranch for a rugged outdoor adventure for the whole family! Mount Enterprise’s population is 525.